Don't neglect this traditional side dish for a successful holiday meal. Finely shred 1 tablespoon orange peel; set aside. Peel and section oranges. 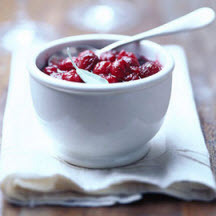 Using a food processor or food grinder with a coarse blade, process or grind orange sections, cranberries, and currants until coarsely chopped. Stir in sugar, almonds, cinnamon, and reserved orange peel. Cover and store in the refrigerator up to 2 weeks, or freeze up to 6 months. Thaw overnight in refrigerator before serving. Serve as an accompaniment to roast poultry or pork. Garnish with orange peel curl, if desired. Recipe provided by Better Homes and Gardens - BHG.com a member of the Home and Family Network for the best of cooking, gardening, decorating and more. © 2003 Meredith Corporation. All Rights Reserved.